Salla Tykkä is a Finnish artist, born in Helsinki in 1973. Her film installations have recently received much critical acclaim in Europe, particularly the films Lasso (2000) and Thriller (2001), both 35mm colour, 3 min 48′ and 6 min 50′ respectively. Together with Cave (2003, 35mm colour, 10 min), they form a trilogy, which is loosely “about” a girl’s passage into adulthood. In each, the focus is a young female protagonist who undergoes various rites of passage. The first international presentation of the completed trilogy took place at an exhibition at the Tramway gallery in Glasgow, Scotland in May 2003. In this essay I examine how Tykkä’s referencing of cinema within a gallery context contrasts with many of her contemporaries in that she not only works in a non-deconstructionist vein but also pursues an inquiry into spectatorship, narrative and genre conducive to feminist aesthetics. Unlike many of her contemporaries, who tend to use cinema’s narratives as forms that can be broken down into component parts, analysed and recomposed in a rather abstract manner, Tykkä’s work encourages the possibilities of imaginary identification and fantasy that the cinematic scenario offers its spectators. While many contemporary fine art film and video practices have generally inherited radical film theory’s view that these kinds of possibilities are seductions that require deconstruction, Tykkä’s work, by contrast, revels in the spaces of fantasy and pleasure (1). In Tykkä’s trilogy, the space of fantasy is opened up, generating the potential for new narratives on the part of the viewer, a factor related to Tykkä’s use of duration in conjunction with the image of the white screen at the close of each film and the way that she plays with the spectator’s emotions in her use of theme music from recognisable mainstream films. In a review of Lasso, critic Polly Staple rhetorically wondered why the film made her cry: “I can think of plenty of Hollywood films that have had that effect, but art is rarely so blatant” (2). I would argue this response is due to the manner in which the film plays with elements of melodrama. Descriptions of Tykkä’s films typically focus on the genres referenced in each film, cued via the music. 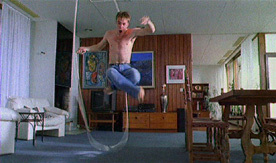 Lasso‘s referencing of the western, via its depiction of a lasso-swinging young man in a domestic space, is intensified by the use of Ennio Morricone’s soundtrack from Sergio Leone’s Once Upon a Time in the West (1969). Meanwhile Thriller‘s use of the Halloween (John Carpenter, 1978) soundtrack brings the horror genre to bear on the film’s already eerie setting. However, all three films primarily work with and through principles of melodrama, which is what opens up the emotional space, bringing one to tears in the gallery and offering the potential space of a new narrative. Before giving an account of the trilogy’s narratives, I want to turn my attention to the deconstructionist mode of film installation, which I see Tykkä as working in contrast to. On paper at least, similar claims are made for artists such as Douglas Gordon and Pierre Huyghe as I am making for Tykkä’s work, i.e. that the appearance of cinematic forms in the gallery allow for the creation of new narratives on the part of the viewer. Jean-Christophe Royoux claims that in the “cinema of exhibition”, of which he sees Gordon and Huyghe as exemplars, new modes of narrative are emerging which “make it possible to define the work of art as an intermediary between the author and the viewer, a structure for activating reading and experience of the processes of thought and memory” (3). I am not in disagreement with Royoux’s notion that the “cinema of exhibition” engenders “participation in the construction of a narrative that makes the viewer the infinite ‘subject’ of the work” (4). However, I want to make a distinction between the kinds of potential for new narratives that film installation constructs out of and from cinema and raise a question about the stakes involved in such claims. The deconstructionist mode of the “cinema of exhibition” tends to occlude content in favour of abstraction and/or a cognitive approach to narrative patterns. Gordon’s 24 Hour Psycho (1993) takes Hitchcock’s classic suspense film and stretches it into 24 hours, literally extending the 24 frames per second of film time into the human time scale of 24 hours. Gordon’s idea, which derived from his pressing the freeze frame button on a video recording of Hitchcock’s Psycho (1960), has been hailed as symptomatic of the ways in which we presently watch films both at home and in the gallery. The home viewer’s activity of replaying favourite scenes, rewinding, forwarding, freeze-framing etc. has been linked to the mobile trajectory of the gallery spectator who enters the space at an arbitrary point in the film, leaves at any time or stays and watches the replay of the loop, most film installations being on a loop. Underlying this celebration of peripatetic mobility is an assumption that classic cinema architecture subjected the viewer to an enforced immobility and a predetermined narrative schema. The cinematic viewer is deemed to be hypnotically seduced by narratives of cause and effect that terminate in closure and to be without the capacity to deviate and perform his/her own wanderings and digressions. However, while most blockbusters may aim towards such closure and audiences can recount plots in linear detail, as Stanley Cavell points out, a film is never remembered in its entirety (5). We always cut isolated fragments of a film into our image repertoire, sometimes inventing the detail of a scene according to the irrational logic of our psychical fantasies. In their inheritance of avant-garde critical film theory and practice, the literalists of the “cinema of exhibition” foreclose on spaces of fantasy and imagination in favour of generating alienation effects and producing a critical spectator. There is […] something intrinsically self-defeating in the idea of “producing” a critical spectator. The project is self-defeating because the means by which the result is arrived at negates the difference between it and its supposed opposite, the naïve or incredulous spectator. The estranging text becomes simply a miniature “ideological apparatus”, eliciting a different set of ideological answers, but still through a process of interpellation (7). Echoing Murray Smith’s sentiments in a different context, Kaja Silverman also writes about the self-defeating nature of this strategy. She argues it safeguards the ego, leaving the spectator’s body untouched at a psychical level, merely challenging his or her conscious identifications (8). Aside from the moral tenor and premise of wanting to challenge the supposedly unwitting spectator’s identification with the spectacle (of cinema in this case), the reading of Brecht’s alienation effect that we have inherited from ’70s film and cultural theory, tends to ignore Brecht’s emphasis on popular entertainment and pleasure (9). While Laura Mulvey in her ubiquitous “Visual Pleasure and Narrative Cinema” states that the destruction of cinematic pleasure by radical filmmakers cannot be viewed (by women) “with anything much more than sentimental regret” (10), she later qualifies this when she says that in feminist aesthetics “[t]he language of form should not intrude or overshadow the free flow of the story and must allow content to come to the fore” (11). A sentiment that echoes my argument here of the limitations of formal works. Tykkä’s double emphasis on form and content in her distillation of cinema in the gallery raises the possibility of inventing new narratives of female experience. (This is also true of other contemporaries of hers that I shall not deal with here such as the Finnish artist Eija Liisa-Ahtilla.) Tykkä works more with the Hollywood narrative form than Gordon or Huyghe, reading it against the grain to reclaim its affective pleasures and seductions for other imaginative possibilities. As Guiliana Bruno expertly shows in Atlas of Emotion, the cinema is not simply a duping machine, but an archi-texture which – via both its architecture of bricks and mortar and the field screen of its filmic texture – permits fluid voyages and affect (12). For Tykkä’s exhibition at Tramway gallery, three separate white cube spaces had been built in the centre of the warehouse-size, shed-like space, each one housing one of the films in the trilogy. (Coincidentally, Gordon’s 24 Hour Psycho was also shown at Tramway in 1993, a former tram station with the tram tracks still running through the gallery space.) The first thing one notices upon entering the gallery is the sound of Morricone’s theme music to Once Upon a Time in America emanating from the middle cube and resounding throughout the space. More subtle strains of Thriller‘s soundtrack emanate from the cube on the far left, Thriller being the first story of the trilogy, although Lasso was made before it. The soundtracks of all the films in the trilogy are a mix of theme music as well as on-screen sound, but, importantly, no dialogue or voiceover. The music serves to cue drama and suspense in lieu of narrative action and dialogue. There is action, but it is so disjunctive that one has to watch and follow blindly as there seems to be little causal sense or meaning to the story. Like her contemporaries working in the deconstructive vein, Tykkä too creates her scenes almost like isolated vignettes, although in her case there is more continuity editing, which often seems odd due to the lack of a literary rationale for the movement between one sequence and the next. In Tykkä’s films, the image determines the story. The scenario develops into a tale of revenge for something that is never asserted, only felt. The man takes a ram down to the water, ties him up and takes off in a rowing boat, all of which appears to be witnessed by the young girl from the window who runs out of the house through the woods to the water’s edge. As she runs, in centre frame, we hear the sound of her breath but not her footfalls. This sound pummels us into the intensity of her interior drama, although we cannot understand the logic of her actions. She enters the shed by the water, looks at herself in a mirror, which reflects a mosaic-effect behind her image, reaches for a nearby gun, and aims. Cut to a close-up of the window framing the shot as the bullet cracks the glass into smithereens. The camera travels through the window and rests on the ram lying dead on the ground, focusing on the ram’s off-white hair before panning away towards the house. The fire is lit. The camera tilts up towards the roof as snows falls, its gradual whiteness merging into a dissolve to an image of a white screen, which lingers on-screen for a moment before we are cued by the music that the film is over. As one sits and watches the gradual evaporation of the story into a suffusion of whiteness, one asks oneself, what have I just witnessed? For it seems more akin to witnessing than watching, time spent with a young girl as she undergoes a strange passage through seemingly unmotivated states of activity. My purpose in recounting elements of Thriller‘s shot sequences is to give some idea of how moments of suspense and bursts of action dissolve into blankness. Again, in both Lasso and Cave, a moment of suspense occurs, creating anticipation, which is followed by a dissipation of that suspense rather than a continuation of it into action. While in Thriller it could be said that the act of shooting extends suspense into action, there are no reactive outcomes to this action, the camera panning across the bloody carcass before moving back to the house, the falling snow bleeding into the image of the white screen. The durational emphasis on the white screen is, I would argue, a kind of passage to the other moments in the trilogy where suspense and its dramatic ramifications come to nothing, all three of the films ending with a similar image while the soundtrack continues. However, unlike Huyghe’s and Gordon’s deconstruction of suspense by exposing its component parts, Tykkä uses suspense to generate a powerful emotional state of play between the opposites of continuity and discontinuity. The narrative continuity of dramatic resolution required of suspense’s discontinuity, i.e. 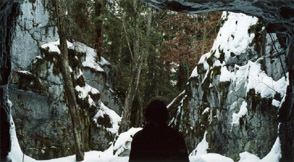 its precariously frozen tension, is foreclosed on in Tykkä’s films, but it is not negated as in Gordon’s 24 Hour Psycho and Huyghe’s The Ellipsis. Rather than suspense’s discontinuity meeting with a narrative continuity, Tykkä’s films perform a gradual dissolution of dramatic action into the ambiguous space of the white screen. It is this movement to an image of abstract ambiguity, both still and pulsating in time, which saves the films from repeating the stereotypes of feminist film theories of representation. If not for this passage to the white screen and the dissipation of suspense that precedes it, the films might be said to give us the usual story of femininity as caught between “the deep blue sea of passive femininity and the devil of regressive masculinity” (13). For example in Lasso, a young girl, returning from a jog and getting no answer whilst ringing a house-bell, goes to the side window where she views a young man engaged in a frenetic game of lassoing. He is fully engrossed in his activity, she watches impassive and fascinated, excluded from his world, as he is from hers, an exclusion made all the more poignant by the camera’s viewing of her from both sides of the window pane. Fixing on a close-up of her face viewed from inside the pane of glass, a tear falls. Is she crying for herself or for the constraints of modern life on this secret cowboy exiled from the prairies and confined to a domestic ornamental interior to perform his act of masculine prowess, which inadvertently feminises him? Nothing happens, there is no communication between them and the camera moves from the girl’s impassive tear-stained face to pan the snow encrusted grass on the ground outside, stopping to focus on a fresh patch of snow which fills the screen and lingers while Morricone’s ode to spaghetti westerns continues. As I have already stated, much has been made of Tykkä’s musical reference to film genres, but perhaps in terms of the hybridity and mixing of genre, one might think of these moments of discontinuity in Tykkä’s work as engaging the genre of melodrama, said to be the women’s film. A consideration of the melodrama genre allows me to account for the effect of Tykkä’s films, the fact that the repetition on a narrative level of passive and or/reactive roles for woman has a positive emotional affect beyond the ostensible conforming to stereotypes. What do I mean by this? their manifest material, but ‘displace’ it into different patterns, juxtaposing stereotyped situations in strange configurations and provoking clashes and ruptures that not only open up new associations but redistribute the emotional energies that suspense and tensions have accumulated in disturbingly different directions (14). While many of the themes Elsaesser enumerates as melodramatic could be said to characterise Tykkä’s narratives, e.g. the lack of freedom of male and female characters, sexual repression, the closed world of the home, pathos, etc., I am not claiming that Tykkä’s films are melodramas per se. Rather, their moments of discontinuity – moments of suspense, heightened by musical accompaniment – generate a melodramatic effect. In Tykkä’s films these moments, unlike in melodrama, are not brought to a (moral) conclusion. My argument is that in Tykkä’s films the dramatic element of narrative is undone by dissipation, so of course they are not melodramas, but what Elsaesser says about melodrama’s critical element is relevant here. Elsaesser says that “[l]etting the emotions rise and then bringing them suddenly down with a thump is an extreme example of dramatic discontinuity, and a similar, vertiginous drop in the emotional temperature punctuates a good many melodramas” (15). In this, they create a space for a confrontation with “the discontinuities in the structure of emotional experience” (16). 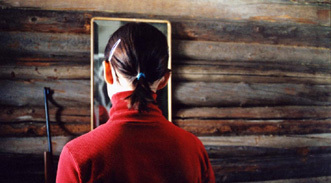 (Although Elsaesser is referring to the characters in the film per se, I would include the spectator of Tykkä’s films because it is she who feels the emotional impact of the gap between the anticipation generated by suspense and its dissipation, which culminates in the durational emphasis on the white screen.). Borrowing this model of melodrama allows me to consider Tykkä’s films as critical spaces, which challenge the spectator to re-imagine new narratives that speak about the emotional life of the body rather than being simply formal as in the deconstructive mode of film installation. It is telling that the final film in the trilogy, Cave, engages with elements of the science fiction genre and a futuristic setting accompanied by a Brian Eno soundtrack. Again, in this film, a moment of dramatic suspense occurs when the female protagonist, a laboratory worker of some kind who has followed the sound of an explosion to a cave interior where three men are surreally, soundlessly, drilling, is spotted by one of the men. He stops, throws his flashlight on her and looks in her direction. The two looks are framed in a shot reverse shot sequence, which is slightly off kilter as the young woman seems to be looking in the man’s direction yet stares blindly into space due to the light of the flashlight. And it is unclear whether he actually sees her or simply feels her presence. After this (non)encounter, which creates a moment of tense expectation for the viewer, he moves off with his companions and she turns and continues to run through the cave in the opposite direction, exiting on a cliffside by the sea overlooking the horizon, a signifier of limits and freedom. As the camera moves back from the scene, a series of dissolves show the girl walking by the rocky shore, eventually bleeding into the final image of the white screen, which endures a few seconds more accompanied by the music soundtrack. In a symbolic sense the girl has traversed a passage through the cave, but more importantly for the viewer, a passage has been created by means of the dissipation of suspense and its fallout into the blank space of the white image. How do we read this passage to whiteness? Tykkä, in compressing Leone’s three hours into three minutes, creates the opposite of Gordon’s stretching of Hitchcock’s three hours into 24. Gordon dissects the present and the moment of suspense into the mechanized movement of time, whereas Tykkä creates a space where the different temporalities of the present rebound on the surface of the image. In the image of the white screen, there is both blankness and movement, a potential space for the viewer to re-imagine her desires and longings (17). This dialectical image, both still and moving, recreates the emotional intensity generated by the narrative tension between continuity and discontinuity that occur in the moments of dissipative suspense. What is recreated is a space where things might turn out differently, a space where the suspension of the outcome and the movement away from resolution generate a gap between anticipation and dissipation that is filled by the unacknowledged spaces of the emotional body. In ’80s feminist film theory, the female spectator was stuck between a rock and a hard place, identifying with the stasis of the image of the woman and identifying with the movement of the narrative trajectory itself, stuck in other words between passivity and activity (18). While this model of viewing could be applied to Tykkä’s films, there is a subtle but significant difference. The tension between the identifications with the image and with narrative movement is reconfigured into the dissolve to the image of whiteness, a gradation which generates a movement away from the film’s image narration and towards a space where a new narrative might be imagined by the viewer. Tykkä’s female mutes show the way towards this emotional space, where movement is not in opposition to stasis. Regardless of the fact that the spectator can get up and physically move in the gallery, it is the physically immobile movement of the emotions that opens up in the gap between suspense and dissipation, providing the possibility of another relation to the space-time of desire. This is why we cry. Tykkä makes us aware of time, but not as the abstract concept of mechanical time or reconstructed real time. She creates a spatialisation of time and a temporalisation of space, opening the viewer to the dynamic of imaginative transportation in the gradation of suspense to a pulsional whiteness. The viewer feels herself as a body in time. This is the difference that Tykkä inserts into the space of film installation. In a presentation at the symposium Live Culture: Performance and the Contemporary at Tate Modern, London in March 2003, Henry Sayre made the claim that the camera’s retreat to the white screen in Lasso creates a psychical space that generates the need (in the viewer) to tell a story. Maria Walsh is a Senior Lecturer in Art History and Theory at Chelsea College of Art and Design, London. She has published essays on the moving image in Screen, Angelaki, Senses of Cinema, filmwaves, and COIL. Her research interests include artist’s film and video, performative writing, feminisms and film phenomenology in a post-Deleuzian framework.